RIO DE JANEIRO, BRAZIL – In addition to celebrating Brazilian literature, the inaugural edition of the Lapalê Festival will commemorate the previous 100 years of the Lapa neighborhood and the 450th anniversary of the city of Rio de Janeiro by presenting a book fair, debates, a literary tour, live music and film screenings on both Saturday, April 25th and Sunday, April 26th. 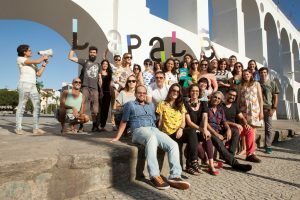 Organizers of the first edition of the Lapalê Festival, photo by Felipe Varanda courtesy of Arteiras Comunicação. The festival officially began in Lapa’s Teatro Odisséia venue on April 23rd, a date that is recognized as both World Book Day and the National Day of Choro, which takes place on that date in honor of the birthday of choro legend, Pixinguinha. The majority of the festival’s events will be held during the weekend on the 25th and 26th and will bring together writers, artists, publishers, historians, designers, musicians, and residents of and visitors to the Lapa neighborhood. Well known for its historic buildings, bohemian atmosphere, and for its lively nightclubs, venues and bars, the Lapa neighborhood often draws over 50,000 people to the region each weekend. During the festival, a literary tour will take place on the morning of Saturday, April 25th at 10AM. Departing from the Praça dos Arcos, the tour will be a guided walk through Lapa, passing by homes of famous writers who once called the neighborhood home and by Lapa’s traditional bars and establishments recognized by the Rio Patrimônio da Humanidade/IRPH (Rio Heritage Institute). 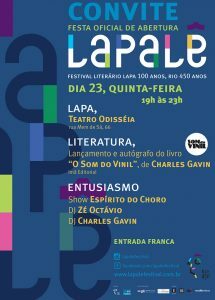 Lapalê Festival event flyer, image courtesy of Arteiras Comunicação. On both days of Lapalê, from 11AM to 6PM, the book fair portion of the festival will feature thirty exhibitors filling the Praça Cardeal Câmara, located across from the famous Arcos da Lapa (Lapa Arches). Several new books will be launched during the event and many authors will be present. Debates during the festival will take place at Fundição Progresso and will include “A Lapa está voltando a ser o ponto maior do mapa” (Lapa returns to being a major point on the map) with Washington Fajardo, Nireu Cavalcanti, Tiago Cesário Alvim and Marcus Faustini on Saturday and “O bairro das quatro letras” (The four letters of the neighborhood) with Marcelo Moutinho, Henrique Rodrigues and authors selected for the anthology “Para ler a Lapa” (To read Lapa) and “Quem faz a Lapa viver… é nós!” (Who makes Lapa live … it’s us!) with Paulo Magalhães, Luis Claudio Vasquez and Leo Barata on Sunday. Films screenings will be held in Lapa’s Cinema Nosso on both days of the festival and will include “Eis aí a Lapa”, “Eu sou Assim – Wilson Batista”, “L.A.P.A”, and “Rainha Diaba” on Saturday and “Postal da Lapa”, “A Farra do Circo”, “Diversidade Sexual”, and “Madame Satã” on Sunday. Live musical programming during the festival will include a performance by Heloisa Fischer, a set by DJ Zé Octávio,a performance by the group Rio Maracatu, and a show with Marcello Magdaleno on Saturday and a show with Marcos Sacramento and a performance by the Monte Alegre Hot Jazz Band on Sunday. Additionally to close out the festival, on April 29th Marcos Sacramento will return to perform live at Semente. For more information and complete program listings, see the official Lapalê Festival website. When: Saturday, April 25th and Sunday, April 26th, 10AM to 7PM. Where: Praça Cardeal Câmara, Fundição Progresso, Semente, Cinema Nosso, and various locations in Lapa. Entrance: Most events are free. Film screenings are R$2 for each show and entry for some performances, including the festival’s closing night with Marcos Sacramento, are R$30. See the complete program for more information.